There were two significant changes this time around. The reworked "Community" section now remembers which community you like to track, and will retain that choice each time you launch the app, or until you change it from the dropdown menu. Also, the app widget will only show content from that community (and will update that content if you turn on AutoSync via "Settings"). Another week, another new release. After shifting to the new UI, we wanted to clean up a bunch of "miscellaneous" cruft that's been in the app since the earliest betas (almost 2 years ago!). The latest release has new parsing code for everything, and a new approach to networking (more below). With version 1.0.1 / 1.0.2, the DevTeam implemented a number of features we have long desired and planned. First, we eliminated the static button bar at the bottom of the home screen, and replaced this with a scrolling (left/right) display of options that can be expanded over time. We then re-implemented all the primary screens in a "pager" so that you can quickly swipe through them with a simple gesture. Next, we implemented a menu "drawer" for less frequently used items. For months now, the app has seen growth in new users at nearly the same pace as +Western Governors University enrollment has grown. WGU continues to rock the world of higher ed (Congrats!) and new students continue to give PocketWGU a try. Across platforms, the total number of distinct users (as reported by Google, Apple, and Amazon) is over 31% of WGU's reported enrollment for November. Read more about Keep 'em coming! Oops... Broken PocketWGU Released (It's Fixed Now)! Howdy Folks, yesterday (11/24) the new 0.9.8 release of PocketWGU went live in Google Play. Unfortunately, the package for that version was missing some files. A corrected package was uploaded yesterday evening, but not before a few folks had downloaded the broken one. If you were one of the unlucky few (the app crashes every time you start it), just uninstall it and re-download from Google Play. The proper release of 0.9.8 will show in the Play Store page as 702k in size, the broken version was 651k. Sorry for that, our bad! Read more about Oops... Broken PocketWGU Released (It's Fixed Now)! Any WGU students using the BlackBerry PlayBook? We received an interesting request from a new WGU student over the weekend. It was for a version of the PocketWGU app that could run on the BlackBerry PlayBook. What's interesting is that the PlayBook can run specially modified/signed Android applications. The DevTeam has created just such a version, and tested it in the PlayBook simulator with sucess. It does seem to work, but it would be great if more folks could test it. Read more about Any WGU students using the BlackBerry PlayBook? While the app does NOT collect any usage statistics (for privacy, PocketWGU only talks to WGU servers and never sends any data to us) the various app markets do tell us a little bit about who's using the app and for how long. Google, Amazon, and Apple keep track of unique users that download the app from their respective stores. As of yesterday, there were 7,340 of these. That represents 22.15% of the total WGU student body (based on published enrollment for May). PocketWGU has been out on the Google market for over a year now, on iTunes since last September, and on Amazon since last December. In that time, many WGU students have graduated (congrats to them all!). Those lucky folk probably don't need the app anymore. Also, some folks try the app and find that they don't need it (we'd love to hear why?) or even, perish the thought, don't like it (Gaak! Please let us know why!). So, it's unlikely that all 7,320 people are still using the app every day. While Apple & Amazon are silent on this subject, Google tracks when users uninstall the app from their Android device. According to Google, the number of Android devices with the app still installed is 70% of the total users who downloaded the app from their market. If we assume (guess) that this ratio holds true for the other markets (which don't track uninstalls), we can extrapolate that 15.5% of the total WGU student body have kept the app. Pretty cool. There's a new version of PocketWGU up on Google Play. Version 0.9.5 fixes a bug in the new home screen widget added in the previous release. If you'd like to use the new widget, please upgrade to 0.9.5 as soon as possible. Also, the widget will only update according to the AutoSync schedule you set (under the Settings tab). AutoSync is off by default, so don't forget to set a schedule of your choosing! 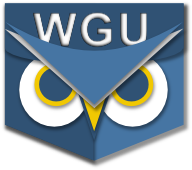 As of yesterday, PocketWGU has been downloaded by over 6,100 WGU users across iOS and Android platforms. Last week it received its 100th user rating, and it's now the highest-rated mobile app designed specifically for WGU students with an average rating (across all markets and platforms) of 4.8 out of 5! Based on growth this year, and WGU's February enrollment numbers, the DevTeam was looking forward to reaching the 20% mark with 1 in 5 WGU students having tried PocketWGU. We were stoked! Then our friends at WGU published their March enrollment: we're back down to 19%. Darn you Western Governors University! Couldn't you stop growing for just a month or two?!?! :-) Congratulations to WGU for continuing to grow and serve the educational needs of even more students. Keep setting the bar higher; PocketWGU will keep trying to keep up! Read more about What's Up PocketWGU?